Being from Missouri, I've always been a huge fan of BBQ. The only problem is that I've never been able to find a store-bought barbecue sauce that actually tasted good, so for several years, I'd make my own sauce from scratch. Unfortunately, making your sauce from scratch is not only time consuming, but it also doesn't last very long. Luckily for me, I decided to try out TJ's barbecue sauces a few years ago and was excited to discover... that they're pretty great! So anytime I see a new barbecue sauce at TJ's, I try to pick it up. Most of them have been pretty great, although there were a few I wasn't impressed by (I'm looking at you, Carolina Gold). When it comes to barbecue sauces, I usually prefer a blend of spicy and sweet, or sweet and tangy, but this Kentucky Bourbon sauce has more of a spicy and smoky flavor to it. If you'd have described it this way to me, I probably wouldn't have been too interested in trying it, but I actually really loved this sauce. It wasn't overly spicy, but had a nice heat to it, and it left out the sweetness that a lot of barbecue sauces seem to have. So far, I've only tried it on TJ's Party Size Mini Meatballs, but I think this could go well on almost any meat. I'll definitely be buying another bottle in the near-future. My wife and I have tried many different BBQ sauces over the years and we just found the Kentucky Bourbon sauce. Both of us agree this is far and away the best BBQ sauce we have ever tasted. It goes with any meat and adds a tangy spice to make the result absolutely delicious. On a disappointing note, we just went to Trader Joes to purchase more and were told that it has been discontinued. 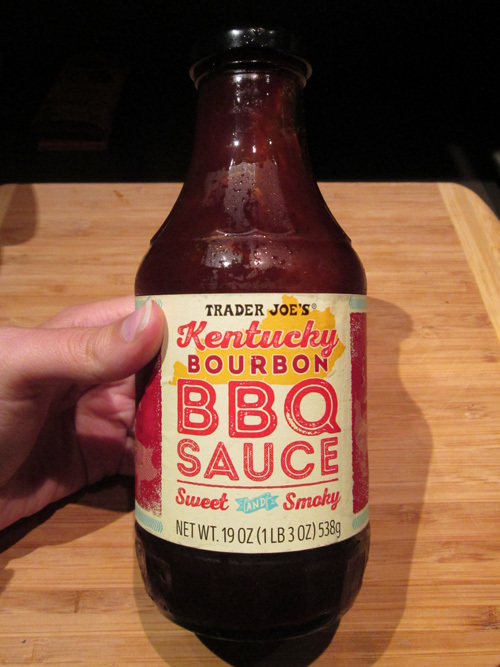 We are very disappointed in Trader Joes at the moment and think that they should restock this BBQ sauce.